Colonel General Alexander Dvornikov, deputy commander, Central Military District, holding the Hero of Russia rank, seen in the Kremlin's St.George Hall, at the ceremony of presenting state awards to officers and experts who distinguished themselves in the counter-terrorism operation in Syria, March 17, 2016. The identity of the man in charge of Russia’s military campaign in Syria has now been revealed after he gave an interview to a leading Russian newspaper after the conclusion of Russia's operations in the Arab republic. The Russian military campaign in Syria now has a face. It is now known that the forces in the Middle East were commanded by Colonel General Alexander Dvornikov. On March 24 the colonel general gave an interview to the state newspaper Rossiyskaya Gazeta, in which he spoke of the successful results of the Syrian campaign. Dvornikov was among the military personnel honored in the Kremlin on March 17. During the ceremony Russian President Vladimir Putin awarded him with the Hero of Russia Golden Medal. Public sources do not have much information on Dvornikov's career. His biography is presented in general terms in his profile on the Russian Cadet Fraternity site: "A native of Ussuriysk [in the Russian Far East], Dvornikov studied at the Moscow Higher Military College, the Frunze Military Academy and the General Staff Military Academy." The motorized rifle battalion that Dvornikov commanded was deployed in eastern Germany until Russian troops left the country in 1994. Between 2000 and 2003 Dvornikov led the division headquarters and then was division commander in the North Caucasus Military District. In the second half of the 2000s he commanded armies in the Siberian and Far Eastern military districts. His latest position has been Deputy Commander of the Central Military District in Yekaterinburg. According to the Russian Cadet Fraternity site, Dvornikov "has been awarded with the For Service to the Homeland in the USSR Armed Forces Medal of the III degree, the For Military Merit Medal, the For Merit before the Fatherland Medal of the IV degree with sabers, the Medal of Courage, as well as with many other medals and awards." "He accomplished everything smoothly and with hard work, was never anyone's protégé and moved up the ranks with great difficulty," said a source in the military who is acquainted with Dvornikov. "He received the Hero Star most likely for the overall result of the Russian campaign in Syria and not for any personal merit," said the military source. "The Russian armed forces' increased military opportunities helped us deploy our forces over great distances and utilize them effectively. This is a result of intense military training, the unexpected verification of the forces' combat capacity and their possession of modern armaments and technology," explained Dvornikov after receiving the medal. In the Kremlin, Dvornikov spoke on behalf of the entire Russian contingent and on its behalf gave Putin a "souvenir" – a photograph of a roof in Syria bearing slogans of gratitude to the Russian forces. However, the media began reporting that Dvornikov had been the direct commander of the operation only a week later. "Little did anyone know that Colonel General Alexander Dvornikov, who has just been awarded with the Hero of Russia medal, for almost half a year had commanded our military contingent [in Syria – RBTH]," writes the Rossiyskaya Gazeta newspaper. According to Rossiyskaya Gazeta, "only a very narrow circle of people" knew of Dvornikov's role in the Syrian operation. Dvornikov's statements in the interview bear an extremely formal nature: The colonel general "reported" to the newspaper's correspondent about the effectiveness of the actions of the Russian military, which "in the course of five and a half months radically changed the situation in Syria." Moreover, he noted that Russia's Special Forces were also active in Syria. "I will not hide the fact that our special forces units are operating in Syria. They perform reconnaissance tasks for the Russian aviation to launch its strikes, they guide our planes to targets in remote regions and carry out other special missions," explained the commander. In general, Dvornikov's interview is interesting not as a summary of the military operation in Syria (his comments added little to the official statements of the Russian government), but as the establishment of his new status in the media. 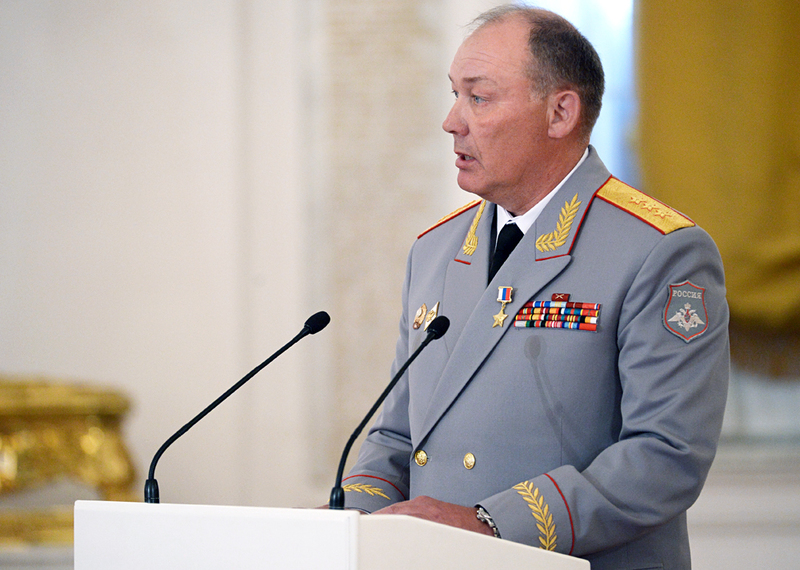 Rossiyskaya Gazeta believes that it is possible that after such success Dvornikov will be appointed to a key position in the Russian armed forces hierarchy.